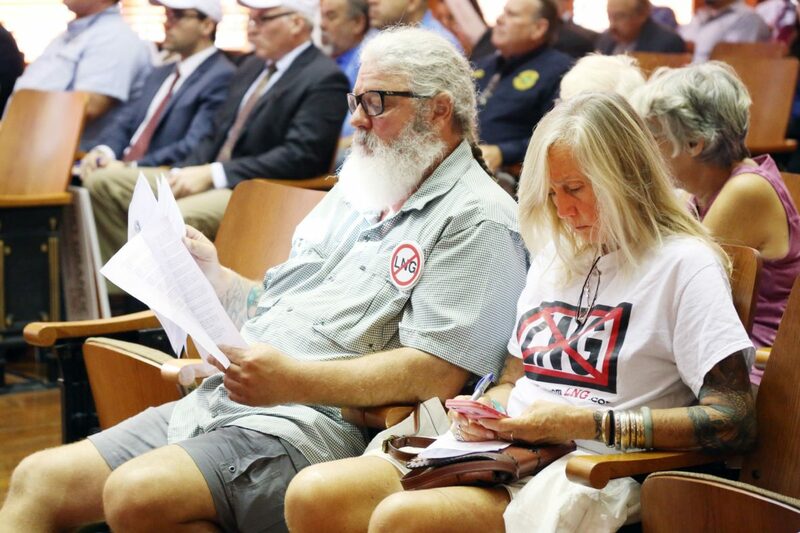 Save RGV from LNG supporters are seen at Cameron County Commissioners Court in October 2017 as a vote to offer a tax abatement to LNG is passed Tuesday morning. Opponents of the proposed Rio Grande liquefied-natural gas pipeline near South Padre Island delivered nearly 2,000 public comments on Monday to the Texas Commission on Environmental Quality headquarters in Austin. Rio Grande LNG includes three companies that have applied to the state and the Federal Energy Regulatory Commission for permission to build a plant for liquefying and shipping natural gas delivered to the Valley via a pipeline. The City of Laguna Vista voted on March 19 to request a contested hearing from the TCEQ for Rio Grande LNG’s air permit. Laguna Vista City Manager Rolando Vela said the City Council took the action because it believes the pipeline would have an adverse impact on the community. In a news release, the Sierra Club said that Port Isabel City Manager Jared Hockema stated that the city will also request a contested hearing. Hockema said the Port Isabel City Commission has voted to oppose the construction of the LNG facilities, joining every other public entity in the Laguna Madre area, including the City of South Padre Island, the Laguna Madre Water District and PointIsabelIndependentSchool District. Hockema said there are many reasons the city is opposed to Rio Grande LNG, which boil down to safety, quality of life and the impact on environmentally sensitive ecosystems in the Laguna Madre.